The 428 Cobra Jet was a V8 engine produced by the Ford Motor Company. This engine was based on the 428 FE engine, but the Cobra Jet was designed and intended for the performance market. 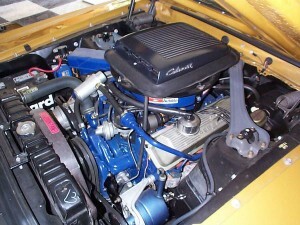 This engine was primarily created and used for National Hot Rod Association (NHRA) races. Another version of the 428 Cobra Jet was the 428 Super cobra jet, but with some additional features to add robustness to the engine. 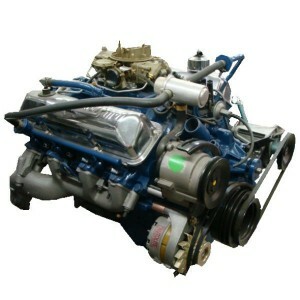 The 428 Cobra Jet engine was first made available in 1968. The engine was then quickly started into NHRA races in February of that year. 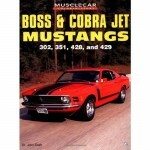 In that first year, 6 Mustangs were equipped with the 428 Cobra Jet, with 4 of those reaching the finals, and one winning its class along with the overall Super Stock Eliminator prize. This engine lasted only a few years, but definitely started out in impressive fashion and without a doubt led to additional future improvements. Ultimately the cooling system was not robust enough for continuous racing, and the Super Cobra Jet was created to optimize that system and other items for improved performance and reliability. The Cobra Jet engine was officially rated at 335 horsepower at 5600 RPM and a peak torque of 445 lb-ft of torque at 3400 RPM. That being said, there was much debate as to the actual power output of these engines. Many speculate that the manufacturers were publishing less than the actual horsepower measured. The actual power output of this engine was more likely to be greater than 400 horspower. All of this was achieved using a compression ratio of 10.6:1. As you probably gathered from the name, this engine has a displacement volume of 428 cubic inches, or 7.0 L for those more familiar with that terminology. This engine has a bore of 4.13 inches to go along with a stroke of 3.984 inches. This engine was aspirated using a 735 cfm 4 barrel carburetor from Holley. The 428 Cobra Jet is cast iron block and head construction. The valve train uses an overhead valve (OHV) system, with 2 valves per cylinder for a total of 8 per head. 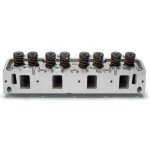 The system was a traditional camshaft in the block orientation using pushrods. Although the engine is a V-8, it is truly Y-shaped as the Crankshaft sits down further, giving the engine the appearance of a ‘Y’. 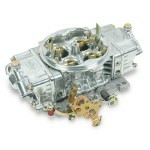 The Cobra Jet engine uses an externally balanced crankshaft with nodular iron construction. This engine also used heavier connecting rods when compared to the street version of the 428, which also required a thicker rod bolt of 13/32″. The 428 Cobra Jet was definitely a strong engine with great performance. This can be seen by the fact that in its debut, 4 of the 6 cars with this engine made it to the finals of their respective heats. The 335 horsepower rating given to this car far underestimates the true capabilities, which was truly more likely to be in excess of 400 horsepower. The Cobra Jet was eventually replaced by the Super Cobra Jet for those people who were truly looking for a drag racing engine. This Super Cobra Jet also came with a shorter rear end to allow for more low-end torque, a critical requirement for any good drag racer.